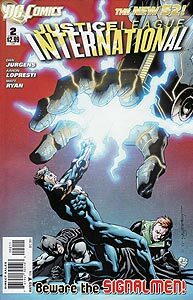 Cover Description: Booster Gold defends Batman and Green Lantern from a giant hand. Brief Synopsis: The newly assembled Justice League International struggles with internal conflict and the global danger posed by giant robots. Issue Summary: The Justice League International quickly finds themselves in dire straits in battle against a giant robot in the Peruvian jungle. The robot easily overpowers Rocket Red and Ice. Fearful for his team's safety, Booster Gold orders an emergency evacuation. The team reunites with Andre Briggs and his assistant outside the smoking ruin of the Hall of Justice in Washington, D.C. Having seen media coverage of the giant robot, Guy Gardner arrives and joins Briggs and Rocket Red in blaming Booster for failing to defeat the robot. However, August General in Iron, Batman, and Godiva speak in Booster's defense. Just as Booster speaks up to put an end to the discussion, Skeets calls and alerts him to the presence of several other giant robots rampaging across the globe. The Justice League is left to debate their response to the situation, unaware that another threat to Earth is approaching from deep space. This issue picks up where the previous issue left off, as a giant robot erupts from the ground beneath the Peruvian jungle, sending the Justice League International flying. Pictured are August General in Iron, Batman, Booster Gold, Fire, Godiva, Ice, Rocket Red, and Vixen. POWER UP: Booster demonstrates the ability to video-conference directly with Andre Briggs and Emerson Esposito via holographic screens generated by his costume. This is a subtle but significant upgrade to communication equipment seen in previous power suits, where Booster relied on a two-way screen embedded in his bracelets. ...Godiva takes the opportunity to aggressively flirt with Booster. She suggestively comments on the revealing nature of his "tights." This is a somewhat ironic statement given that art in DC Comics is, as a general rule, intentionally free from any hint of male genitalia despite the physique-revealing nature of its costumed heroes. It is unclear whether Booster appreciates the attention, as he clearly is distracted by the raging battle outside his bubble. After Ice is injured by the rampaging robot, Booster makes the unpopular decision to evacuate the team to safety. (How Booster, who has been team leader for a mere matter of hours, knows to institute "Evac Plan Delta 33" is unclear.) This situation is evocative of the unpopular decision that Captain Atom made to evacuate an injured Booster Gold and his Justice League team from Mount Everest in 1994's Justice League America #89. LIQUIFIED TIME: Speaking to Batman, Booster references "your Justice League." This suggests that prior to this point in history, there has only been one other incarnation of the Justice League, as seen in the pages of Justice League Volume 2. This indicates that all previous adventures of every other Justice League may have never taken taken place, potentially invalidating every story published between 1960 and 2011. After a joke is made about his appreciation of Appletinis, a cocktail with a reputation for anti-masculinity, Guy Gardner orders a beer from a bartender named "Beau" in Tavern 19 in his hometown of Baltimore, Maryland. Bartender "Beau" looks remarkably similar to writer Beau Smith, the author of many of Guy Gardner's adventures in the 1990s, including Guy Gardner: Warrior #40 drawn by none other than Aaron Lopresti. Confronted with the smoking ruin of the Hall of Justice in Washington, D.C., destroyed by a bombing in the previous issue, Booster Gold is told "never mind that." And the fact that the former headquarters of the Justice League has been reduced to rubble by an unknown attacker isn't mentioned again in the issue. LIQUIFIED TIME: Following the arrival of the eternally arrogant and disruptive Guy Gardner, Emerson Esposito mentions that the United Nations has never previously sanctioned a team of heroes. That not only confirms that the Justice League International has never existed, but also creates doubt that the Global Guardians, Godiva's former team, ever existed, either. SOLIDIFIED TIME: Ice admits to having dated Guy Gardner, but advises him not to "make more of it than it was." In the pages of Justice League America, the pair made quite the couple. However, Following Ice's death and rebirth, the relationship has chilled considerably. August General in Iron is the first team member to step up in support of Booster Gold as team leader. This endorsement is significant: August General is himself the leader of the Great Ten, a Chinese super team, and knows a thing or two about leadership. And that's saying nothing of the societal and political differences between the United States of America and The People's Republic of China. As defined in the United Nations Secretary General's bulletin ST/SGB/2008/5, "Sexual harassment is any unwelcome sexual advance, request for sexual favour, verbal or physical conduct or gesture of a sexual nature, or any other behaviour of a sexual nature that might reasonably be expected or be perceived to cause offence or humiliation to another, when such conduct interferes with work, is made a condition of employment or creates an intimidating, hostile or offensive work environment." Booster's sanctioned recourse for this inappropriate behavior is to notify the behavior to his department head. While Andre Briggs is standing mere feet away, he has turned a blind eye to the situation. This sort of behavior probably explains why the United Nations has been dealing with several reports of high-profile cases of sexual harassment in recent years even without the aid of Godiva's creepy, clinging hair. SOLIDIFIED TIME: Welcome back, Skeets! Booster's robot sidekick Skeets makes his first post-Flashpoint appearance via communicator from the "Booster Cave." Booster's dialogue subtly implies that Booster Gold, who first theorized creating his own Booster Cave in Booster Gold, Volume 2, #21, may be still in the time-policing business behind the scenes. Boosterrific Review: Dan Jurgens and Aaron Lopresti turn in another solid issue, dropping hints that this corner of the DCnU isn't as different from what came before as might have been feared: Ice and Guy Gardner had a previous relationship, Skeets is still Booster's sidekick, Batman is still an anti-social badass. If the issue has any flaws, it is that the story is still more set-up than resolution: the team is still fractured, the giant robots are still a mystery, and the terrorist sub-plot is barely even addressed. There is plenty to look forward to, but it sure would be nice to get there a little faster.